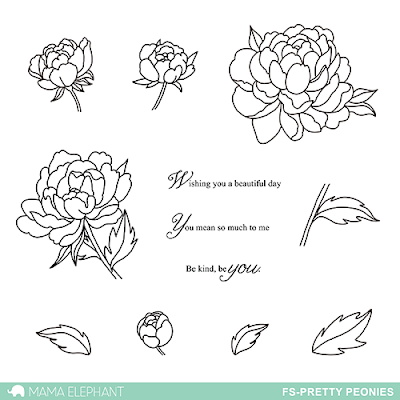 We are introducing Pretty Peonies today, designed by the lovely EunJi Jung. Peonies have always been my favorite flower, and it's so interesting how there are so many different variations of illustrating this gorgeous flower. We really love EunJi's style! I stamped the images with a grey Versafine ink using some minimal masking between each image so it appeared as one large bouquet of pretty peonies. The coloring is done with watercolors, which I painstaking did over a long rainy weekend. Time consuming (for me at least), but I was very pleased with the results! The sentiment is from Labeled Messages. GORGEOUS!!! I wish that I could grow Peonies in Orange County,CA!!!!! You colored them beautifully. Beautiful card! Love the stamp set too!